Here is a summary of only some of the most prominent findings. This is believed to be the oldest complete multiple page book found in the world. 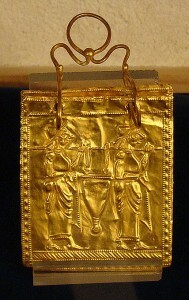 It is made of six plates of gold, each 5 x 4.5 cm, and bound with two rings. It dates to 600 BC. It was unearthed from a tomb some 60-70 years ago, along the Strouma River in southwestern Bulgaria. 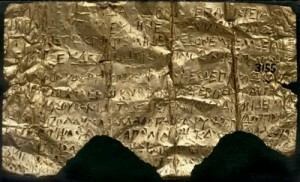 It was donated to the Bulgarian National Museum of History in Sofia, Bulgaria, in 2003. The plates contain text in Etruscan characters, and was likely a type of prayer book made for the funeral of an aristocrat. 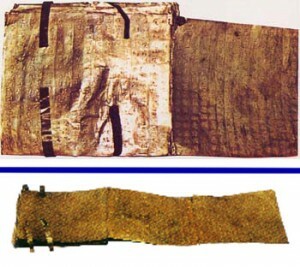 This discovery is especially interesting to Latter-day Saints because the date places it at the same time as when Lehi and his family left Jerusalem, indicating that this form of bookmaking and bookbinding was practiced in the Mediterranean region at the time. It is similar to the description that Joseph Smith gave of the gold plates of the Book of Mormon. 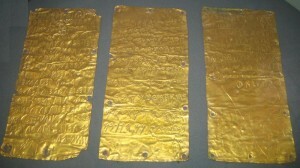 This set of three gold plates was discovered in 1964 in an excavation of a sanctuary in ancient Pyrgi, in Italy. They contain holes around their edges, which indicates that they were likely bound together in some form at one point. The plates date to 500 BC, and contain a dedication by King Thefarie Velianas to the Phoenician goddess Astarte. Two have Etruscan text, and the third has Phoenician. …a prime example of the spread of the Phoenician practice of writing sacred texts on golden plates from their original center in Phoenicia, via Carthage, to Italy, and is roughly contemporary with the Book of Mormon’s claim that sacred texts were written on metal plates by the Phoenicians’ closer neighbors, the Jews. The Pyrgi Tablets are now at the National Etruscan Museum in Rome, Italy. Perhaps the most famous example of ancient writing on metal plates is the Copper Scroll, found among the Dead Sea Scrolls in Qumran by an archeologist in 1952. Its Hebrew text was inscribed on two rolls of coppper, and dates to 50-100 AD. Because it was found in rolls, and the metal was corroded, it had to be cut apart into 23 strips to be read. Both rolls were part of the same document. The text, interestingly, describes the locations of hidden temple treasures from the Second Temple of Jerusalem. In other words, it’s a kind of treasure map. 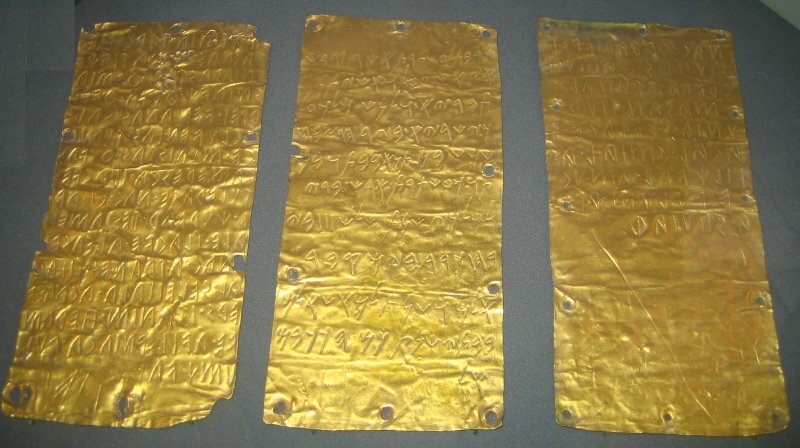 …it is a clear example of an attempt to preserve an important sacred record by writing on copper/bronze (Heb. nechushah) plates and then hiding the document. Unfortunately, no hidden temple treasures have yet been discovered by reading the text. 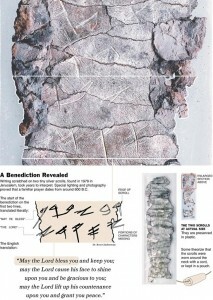 John A. Tvedtnes, “Copper Scroll from Qumran,” Book of Mormon Research. This is a set of nineteen gold plates that was found in December, 1965, buried under a five-storied pagoda in Iksan, Korea. Each plate measures 14.8 x 13.7 cm and was found inside a bronze box inside a stone box. The plates are hinged together, and have two gold bands that wrap around the plates. They date to the 8th century AD. The text opens with a group of monks who circumambulate the living Buddha three times and then sit down to listen to his teachings… He warns of a future period called the “Latter Days of the Law” when the oral transmission will have decayed. He prophesies that there will be at least some enlightened beings who will understand and teach his true doctrine. He then promises that the country that preserves and teaches this sutra will have to be honored and worshiped by the worlds of gods, men, and evil spirits. It will become like a chaitya, or temple. It is apparent that this promise was the motivation for Korean Buddhists to inscribe the sutra on gold plates and preserve it under a pagoda. The plates are part of National Treasure No. 123, and located at the National Museum of Korea in Seoul. John A. Tvedtnes, “Korean Diamond Sutra,” Book of Mormon Research. 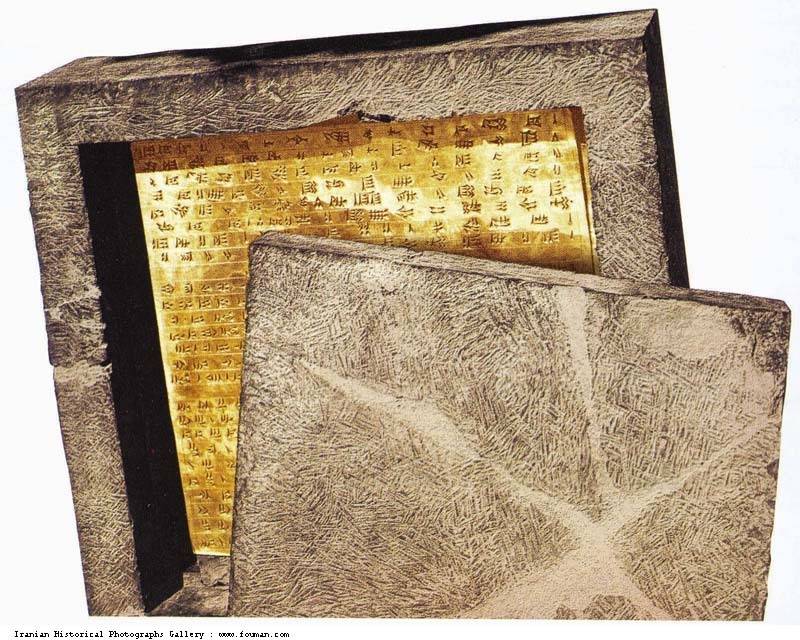 Paul R. Cheesman, “Ancient Writing on Metal Plates,” Ensign, October, 1979, 42. Discovered in 1979, these scrolls were found inside one of a series of burial caves called Ketef Hinnom in a hillside just west of Jerusalem. They were two small silver scrolls, about 1″ x 4″ in size, and much care was taken over a three year period to unroll them to read them. They had archaic Hebrew text on them. They determined that the scrolls date to approximately 600 BC, very near the time that Lehi left Jerusalem. Amazingly, the scrolls contain the oldest surviving citations of the Hebrew Bible, in addition to the oldest surviving reference to Yahweh (Jehovah or LORD). The text comes from primarily Numbers 6:24–26, which is a priesthood blessing (or ordinance) the Lord instructed Moses to teach Aaron to give to the Israelites. 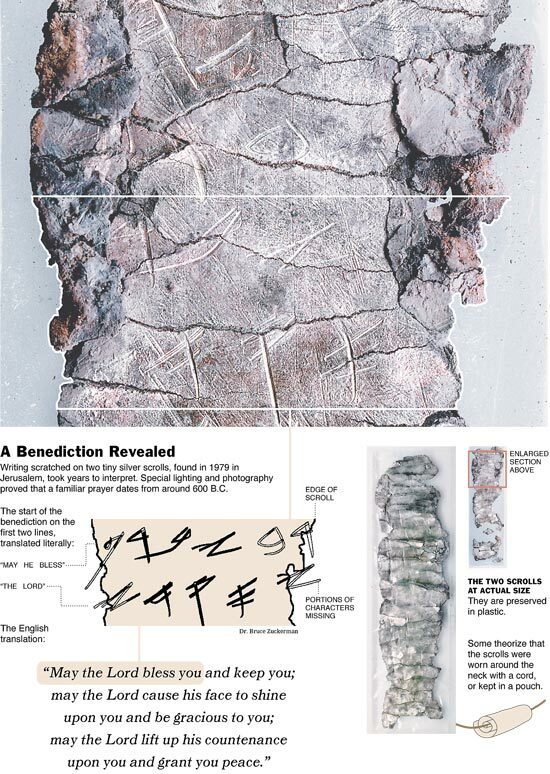 This shows that the Jerusalem people of Lehi’s time did, indeed, write sacred texts on metal, and provides evidence that the first five books of Moses existed at the time Lehi left Jerusalem, which would have been required if the brass plates were to contain them (1 Nephi 5:11). This reminds me of the divine bestowals of power, protection, prosperity, and seed found among the Egyptians, and even on the Rosetta Stone. The plates are now located at the national museum in Tehran, Iran. This is a remarkable set of about 35 small pieces of gold foil that have been found in ancient tombs across Greece and Rome. They are inscribed in Greek text, and most date to the fourth century BC. … [they] give specific instructions for what the initiate is to do during their journey into the Afterlife, including meeting a number of guardians and gods who will ask them questions and to whom they must give certain passwords. 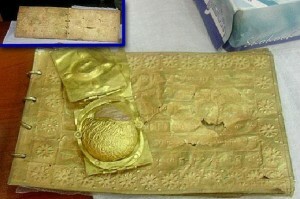 In October 2005, police in Tehran, Iran, recovered several artifacts that had been sold to smugglers by a farmer who had found them while plowing a field. One of these artifacts was a book made of eight plates of gold, and bound with four rings on one side. The codex is inscribed with cuneiform script, which was a commonly used in the ancient Near East. It is believed to be from the Achaemenid period, because of its codex format, which would date it to sometime between 550 BC and 330 BC. Again, dated to shortly after the time period of Lehi and his family, and in the Middle East. The current whereabouts of this artifact are unknown to me and those I’ve asked. Instead of continuing to chase the Jordan Lead Codices down a dead-end road, it might be more productive for the media to help find this codex, and determine its authenticity and meaning. John A. Tvedtnes, “Achaemenid Gold Book,” Book of Mormon Research. As you can see, there are many examples of modern day archeological discoveries of ancient writing on metal plates, and I only mention a few. These were unknown in Joseph Smith’s time, yet many attest to the fact that writing on metal plates was a practice during Lehi’s day in and around Jerusalem. ← Jordanian Lead Plates: Authentic or Forgery? Great post Bryce! I got to see the Silver Scrolls in person last October when my family visited Israel. Really interesting stuff. Great job Bryce, I’ve been wanting to put together a resource for these findings all in one place and you’ve done it already! Thanks for the great research. I think it’s important to remember that the claim by a 23 year old farm boy that records on metal (brass) plates existed in Jerusalem around 600 B.C. is a modern historical fact. We get excited when there are new discoveries that lend support to what we already know is true. I think with each one of these discoveries we understand a little more perhaps what the original plates might have looked like. Thanks J. Max and Steve. I was amazed by the volume of such finds that have been made in the last century. There are literally hundreds of examples of writing on metal plates, and these are only a few. I had no idea there were so many! See also H. Curtis Wright, “Ancient Burials of Metal Documents in Stone Boxes,” in By Study and Also by Faith: Essays in Honor of Hugh W. Nibley, edited by John M. Lundquist and Stephen D. Ricks. SLC and Provo, Utah: Deseret Book Company and FARMS, 1990, Vol. 2, pp. 273-334. The Book of Mormon contains some scripture and old testament stories from the Bible. Since the Book of Mormon is the most correct book on earth, the keystone of the Mormon religion and one can be closer to God by abiding in it’s precepts than any other book, would the Book of Mormon be considered an addendum to the Bible? I am studying Gold Plates right now and was wondering of all the plates that you list here, is there away to find out how thick they were on average and what the other base metals were? Joseph Smith plates if Pure gold would wiegh 212 lbs. I believe they were Tumbaga about 8 karat and he only show the eight witnesses 1/3 of the plates. not all the plates. “showed to us the plates the said Smith had trnaslated”. The plates he carried through the woods were about 37 lbs. All the paltes if tumbaga would be about 117lbs. Thankyou for a reply if possible. We know the dimensions of the plates but we don’t know how many “pages” there were. We know they were almost as thick as common tin, (“engraven on plates which had the appearance of gold, each plate was six inches wide and eight inches long and not quite so thick as common tin…. The volume was something near six inches in thickness….”(Joseph Smith, Times and Seasons, v3:9, March 1, 1842, 707.)) so we should be able to research the thickness of common tin at the time and relate that to the dimension of the plates to determine approximate page number. The plates were slightly thinner than tin and collectively about five to six inches thick. Moroni views the plates as not being “large” and we don’t really have any reference to draw any solid conclusions from. However, he fears that the record may have imperfections because it was recorded in something less accurate than Hebrew. Reformed Egyptian might have been some kind of extreme shorthand that would allow for recording a large amount of information into a small space. Your assessment of the Book of Mormon as “contains some scripture and old testament stories from the Bible” isn’t very accurate, but in an attempt to address the spirit of your question, it would be incorrect to label the Book of Mormon as an “addendum” in my opinion. The Bible is not one record, but a series of records compiled into a collection. The Book of Mormon is an abridgment of a collection of records. In both the Bible and Book of Mormon, prophets and even the Savior quote from prior prophets. In the Book of Mormon, we have several chapters of Isaiah recorded and another account of the Sermon on the Mount. These are quoted for specific reasons that are too detailed to go into here in this short comment. The Bible and the Book of Mormon, respectively, claim to contain various accounts of writings, history and witnesses of God’s dealings with mankind in different locations and circumstances. Upon immediate examination we simply see two books and try to understand how they relate to one another. When you research each you find a much more complex scenario described within the text of each that deserves investigation if at least to understand each record more fully. Thanks Steve for the comment, I have found out that common tin was really starting to be used in 1820 in The United States, that is probably why Joseph Smith used the comparison, that tin was .15 of an inch or 15/1000th of an inch. 20% less thickness would be 12/1000th of an inch. (writeable on plates i believe) Mormon would have used as little in thickness as possible its only logical, weight ,durability etc. He may have considered this since his nation was under assult at the time as well. If the book were pure Gold there would have been a crush factor over 1,600 yrs. Are you familiar with the stroy of Joseph running witht he plates? If The Book of Mormon is true then the writings of the apostle Paul can not be true. @Steve care to back your random statement up with any facts? Steve, unfortunately this is common mistaken belief about the LDS Church. We believe in a gospel of grace and works, as taught by the early Christian apostles, including James (James 2). We must not only believe in God, but do what He has commanded us to do. Otherwise our faith is dead, and profits us nothing. @Steve, your misinterpretation of LDS teachings is what contradicts the Book of Mormon and the Bible. Reducing the tenants of a faith down to “a gospel of works” displays little knowledge of what Latter-day Saints believe. Broad-brushed misinterpretations do nothing to help the conversation. It is true that Latter-day Saints seek to keep the commandments because Jesus Christ taught that if we love him we will keep his commandments. We love Christ so that is one of the things we do to show our love to him. As far as the matter of salvation is concerned, I’ve never been taught, nor do I believe that “works” will “get” me into heaven without Jesus Christ. Wow, so much to read! “For just as the body without the Spirit is dead, so also faith without works is dead. (James 2:26). What is the Spirit? What is faith and where does it come from? Haha, sorry Steve, I tend to be a little long-winded even when I’m typing. I pulled those from an article I wrote on the subject and I probably just should have posted a link. If you’ll allow me to explain the verse in James, I think the principles become quite clear. The reason “faith without works is dead” is because faith IS works. Faith is the action of belief. To believe is to simply or strongly acknowledge something affirmatively. Faith requires that you act according to those beliefs. This is the origin of faith. And for what it is worth, Steve, I’m not claiming that I know these things because I believe the words of the Bible or the Book of Mormon, I know them because I know Christ. I sought him through respect and obedience to his commandments and by repenting of my sins and through faith, it happened; I remember the evening. I know the grace of Christ and the pure love of Christ; I found peace, hope, assurance and comfort in his atonement. I know he lives. Paul truly taught that we are not saved by works, and in this he was referencing the works and deeds of the law of Moses and perhaps by extension any actions that man takes that makes him suppose that his efforts somehow outweigh the atonement of Christ. Paul said that “For by grace are ye saved THROUGH faith”, and once we understand what faith is, we understand how we are saved by grace through it. Faith is not a light or easy thing for many people. It takes trusting in someone that you initially do not know, but if you begin by obeying his commandments, he will reveal his love and wisdom to you in degrees through that obedience. This obedience grows into trust and blossoms into love and then we find ourselves willing to give up anything that keeps us in the least degree from Christ. We repent, he heals us and we are justified in him. That’s great! 🙂 Glad you could find what you were looking for here. Hope you’re all doing well in Georgia. Thank you. Your comments are appreciated and helps me understand more clearly, even though I have been a member all my long life. A web search found this site. I am looking for information on gold plates viewed in the Korea National museum in 1973 or 74. They were displayed along with a large assortment of gold items taken from a tomb and had two uniformed guards prohibiting photographs of the plates only. The plates were hinged with thin flat gold rings accordion like, as I recall and there was a stack perhaps the size of B of M plates and a long display of them stretched out several feet. I’ve looked a photos here and none are as I recall; the ones in the museum were not crinkled like ones above and was many more pages than the Etruscan Gold Book. I have debated for many years of contacting someone I might could trust. I had a stroke a couple years back and need to find someone trustworthy. My grandfather was digging a post hole near Salmon Idaho, about 80+ years ago and hit a stone tablet that was taken from his possession and never returned. Does anyone know how they were inscribed? What type of tool was used? If the Book of Mormon is the most correct Book ever then prove it and not just by saying it prove it with facts viable facts that can be seen and or read . One more thought after reading this article , all of these metal Books can be still read today they can be studied and are placed in Museums around the world but we are suppose to believe that the plates Smith found were taken by God and yet none of the other plates were taken ? C’mon I was born on a Tuesday but not last Tuesday !